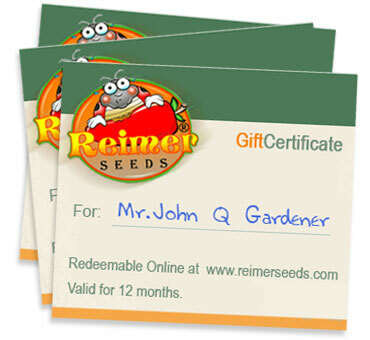 Reimerseeds Gift Certificates you can’t possibly give the wrong gift! Reimerseeds Gift Certificates are available in any amount you desire, starting at $25, or at pre defined $50 and $100 denominations. They are only redeemable online at www.reimerseeds.com. To purchase an Online Gift Certificate, select any Gift Cert denomination below, and click “ADD TO CART” when done.